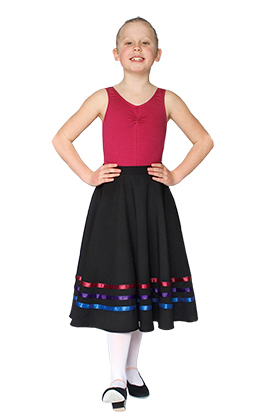 Little Ballerina Circular Character Skirt with Bright Ribbons. “W” donates waist size in inches, “L” donates length to mid calf in inches. If you cannot see your required size, please email us at info@duodance.co.uk. We have advertised only the most popular sizes. Local to Duo Dance? Don’t forget our “Order and Collect at Shop” option on our Checkout page.